Many studies over the past several years have shown that a growing number of young adults in American society have abandoned the faith with which they were raised, and now identify themselves with no organized religion. This has been shown to be common among young adult Catholics, in particular. 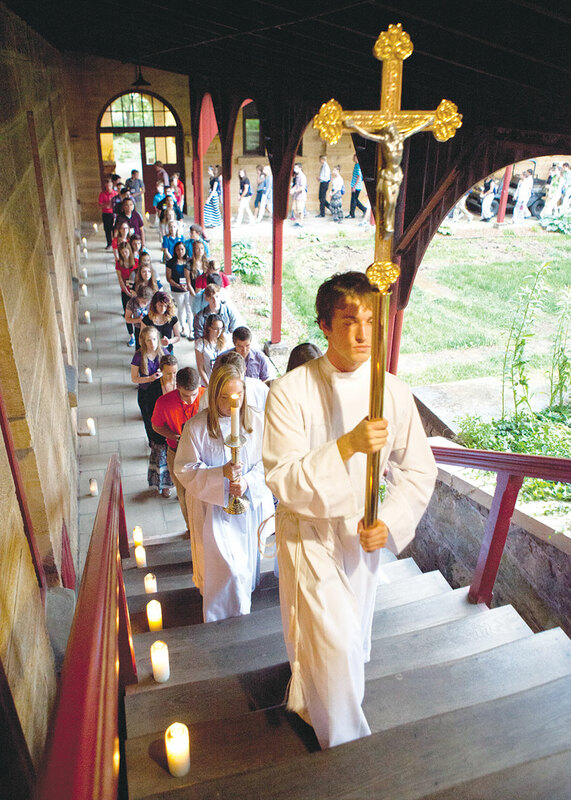 Saint Meinrad Seminary and School of Theology in St. Meinrad is launching an initiative to help parishes reach out to young adult Catholics and help them rediscover and renew their Catholic identity. Late last year, Saint Meinrad received a $1.38 million grant from the Indianapolis-based Lilly Endowment Inc., to support this initiative. The grant is part of a broader $19.4 million initiative focused on young adults and faith in which the Lilly Endowment is partnering with 13 Christian institutions across the country. Saint Meinrad is the only Catholic organization among them. Tammy Becht will oversee Saint Meinrad’s program to help parishes reach out to young adults. She is also director of Saint Meinrad’s One Bread One Cup, a program of liturgical formation for youths and young adults. Saint Meinrad plans on working over the next five years with 12 to 15 parishes within a 250-300 mile-wide radius of the southern Indiana seminary. Each parish participating in the program will assess itself in regard to young adults, and seek to learn about this population group that is already within it and those who live in its vicinity but are not connected to the parish. The parish would then build up a core group of volunteer ministry leaders who would receive training from Saint Meinrad to effectively reach out to young adult Catholics in the broader community and help them build up their faith. A key way that the Saint Meinrad program will promote this is through the encouragement of an intentional life of faith and prayer in the young adults’ life at home. Becht says Saint Meinrad is well positioned to take this approach to young adult ministry because its monastic and seminary communities do this themselves every day on “the hill” on which they live in southern Indiana. One way that Saint Meinrad will foster a life of prayer and rituals at home for young adults is through the development of a prayer book for them. Father Denis said helping young adults build up faith rituals in their daily life can be a way to connect them to parishes. St. Bartholomew Parish in Columbus may be one of the faith communities that Saint Meinrad will work with through this program. Father Andrew Syberg, St. Bartholomew’s associate pastor, said his parish has young adults among its members, but also acknowledges that the broader Columbus community has many Catholics in their 20s and 30s who are not practicing their faith. St. Bartholomew, Father Syberg said, offers young adults service opportunities, times of prayer and eucharistic adoration, and the chance to help with its youth group. “At this point, you’re throwing whatever you can out there and seeing what sticks to the wall,” he said. Although it can be challenging to reach out to young adult Catholics in the broader community, Father Syberg said that they can play a vital role in the Church once they become engaged with their faith. Becht said that a main purpose of Saint Meinrad’s program will be to help parishes regularly re-examine and adjust their outreach to young adults to make it more effective.